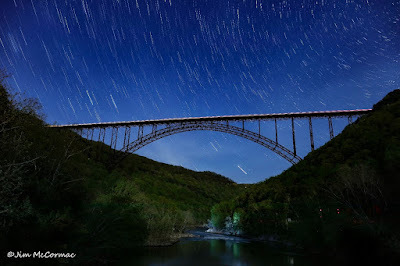 A long exposure brings out star trails, with the mighty New River Gorge bridge as frontispiece. 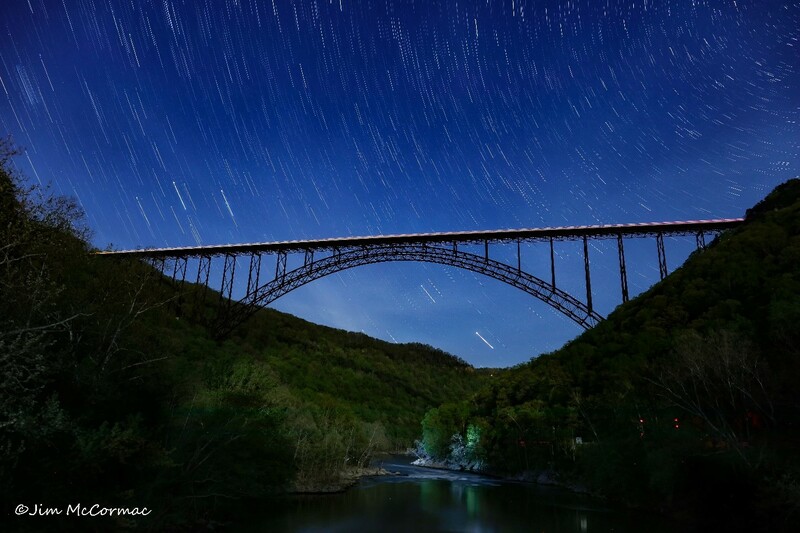 I made this image at midnight from deep within the gorge. 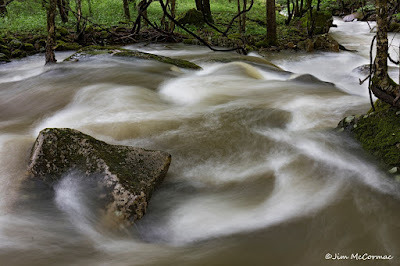 I spent all last week near Fayetteville, in southern West Virginia, participating in the New River Birding & Nature Festival. This, I think, was my 14th year of leading trips and giving talks at this event, which celebrated its 16th year with this go-round. It is one of my favorite events, because of the people, the excellent organization of the event, and of course the outstanding biodiversity. Thanks to Rachel Davis, Geoff Heeter, Keith Richardson, Paul Shaw and everyone else involved in planning and executing the NRBNF. Next year's dates are April 29 through May 4. You can come for part of it, or the whole thing. We'd love to have you. Festival details are RIGHT HERE. 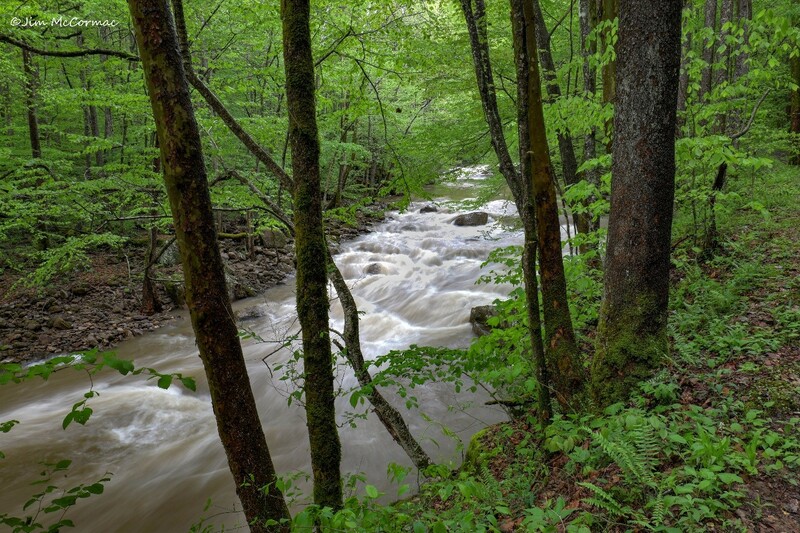 Swollen by spring showers, the waters of Glade Creek rush through a rich Appalachian cove forest. Landscapes are stunning in the New River region. I take very few photos during the event. Leading groups each day doesn't allow for much photography, as it's more important to find COOL THINGS and help everyone else see them. I usually stay for a day following the festival, and create images of things that I saw during the week. Following is a hodge-podge of imagery from this year's festival. The waters of a mountain brook race by banks lined with yellow birch, pipevine, and other interesting plants. Spring is normally wet down here, but not this year. Monday through Friday was dry and mostly sunny, with some showers towards week's end. Rare is rain so intense that it keeps us from our appointed rounds, though. Spring came late to this region, as it did throughout much of the east. 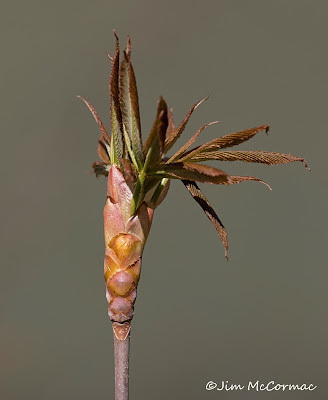 Unfurling leaves of a yellow buckeye unfold in the highlands of the Monongahela National Forest. Normally the buckeye leaves would be at mostly grown by this time, but tardy foliage made it much easier to see birds, and we saw plenty of those. By the last days of the festival, warmth and sun had stimulated a floral explosion, especially at lower elevations. 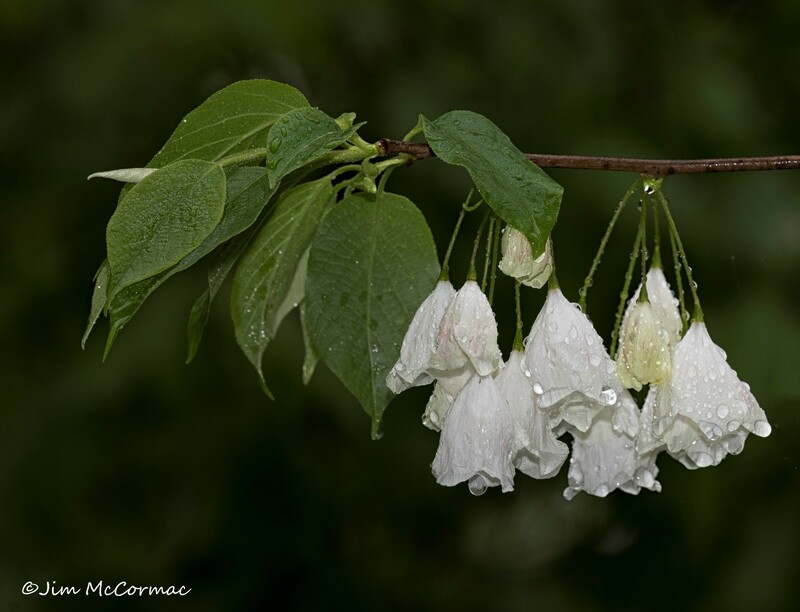 I made this image of a beautiful mountain silverbell during a light shower last Sunday. Normally the silverbells are nearly through blooming by the festival, but this year everyone was treated to these small trees at their peak. I was pleased to find a small colony of adder's-tongue fern, Ophioglossum vulgatum, in a rich woods along Glade Creek. 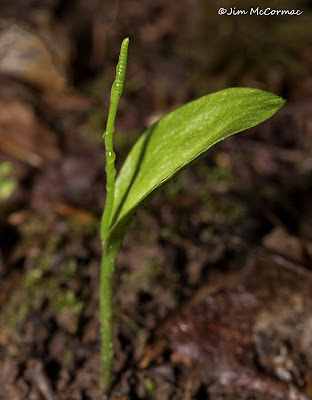 This strange little plant hardly resembles a fern, and is easily missed. It's nice to conduct our field trips in such floristically diverse sites. If the birds get a bit slow, we sometimes divert our attention to the plants. Festival organizers added a new trip this year that included a focus on amphibians. 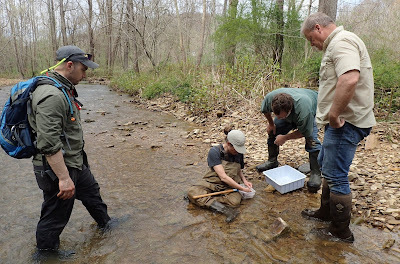 They enlisted the services of Dr. Tom Pauley, amphibian expert and author of Salamanders of West Virginia, as trip leader. 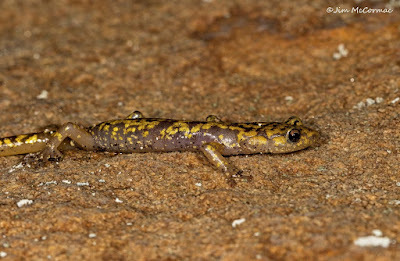 That outing found at least 15 species of amphibians, including some very cool salamanders. One of them was the green salamander, which is a bit of a Holy Grail to amphibian seekers. 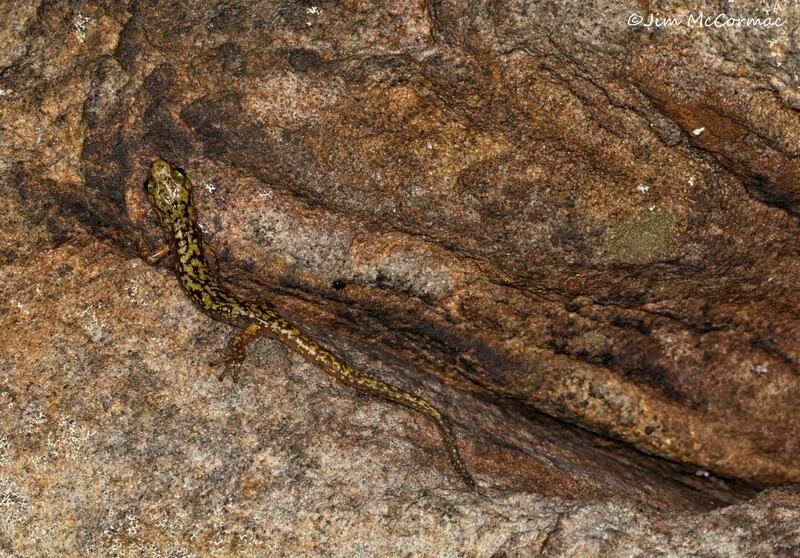 Green salamanders spend their days hiding in crevices of cliff faces and are tough to see. I returned to a cliff where Pauley's group had found a few green salamanders along with Paul Shaw, Suleka Deevi, and warbler expert Tom Stephenson. 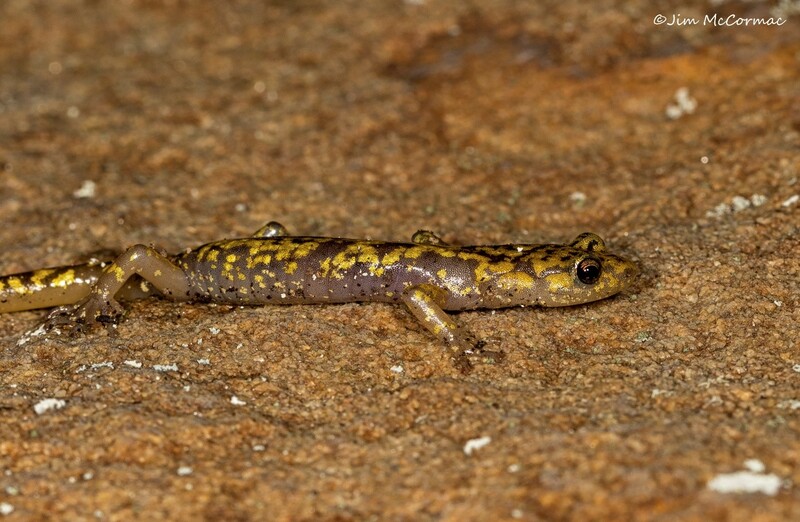 We went at night, when the salamanders emerge from hiding and hunt small invertebrate prey on the cliff faces. In this photo, a green salamander has just emerged from hiding. A closer view of one of the four green salamanders that we found. Their dappled coloration blends well with the lichen-spattered rocks that they frequent. It was interesting to watch the elfin beasts stalk small flies and other prey, snapping them up with astonishingly rapid lunges. 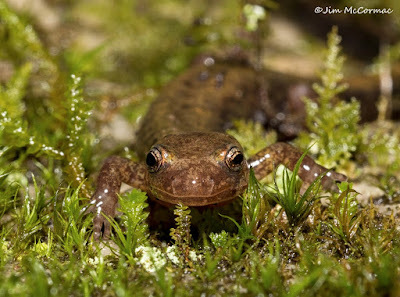 A four-toed salamander marches through an elfin forest of moss. It was one of three that I saw. 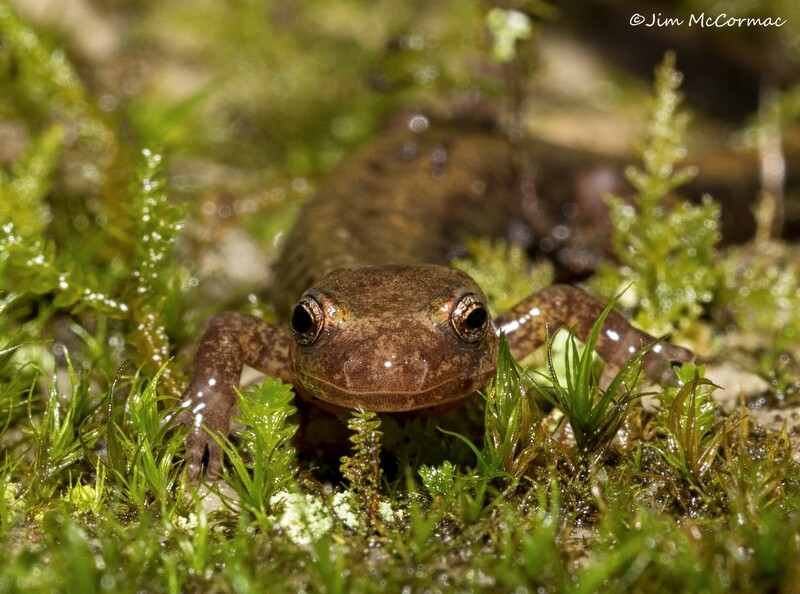 At least 22 species of salamanders occur in the areas visited by the New River Birding & Nature Festival. Salamanders aren't the only threat faced by bugs. 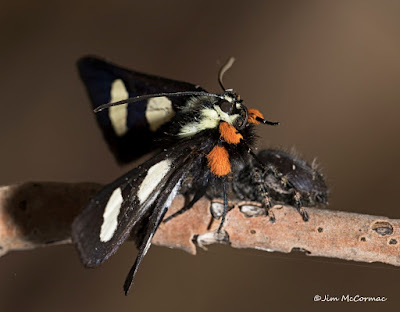 Here, a jumping spider has seized an eight-spotted forester moth. Never know what you'll see on our field trips, and an abundance of expert guides and sharp-eyed attendees means that interesting sightings are commonplace, and someone will usually know what any organism in question is. Birds, of course, are the festival centerpiece. I just didn't get many photos of them this year. 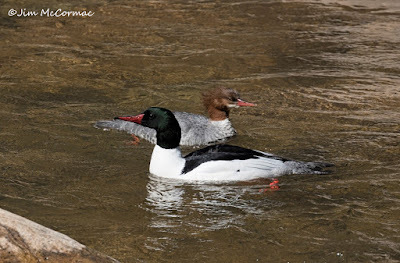 This is a pair of common mergansers. This year, we saw over 20 of these big showy fish-eating ducks on the Cranberry Glades trip. 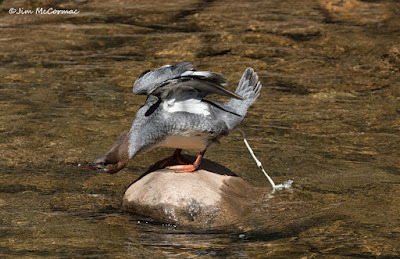 They have become common nesters along the Williams River, a gorgeous mountain river. 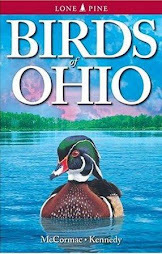 I don't know what the final tally of birds was, but it was probably in the 150 species range. 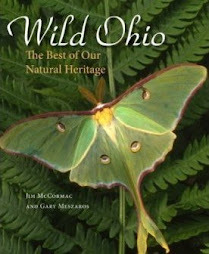 More important than racking up a big list is the chance to see well and study interesting species. We had those opportunities in spades. 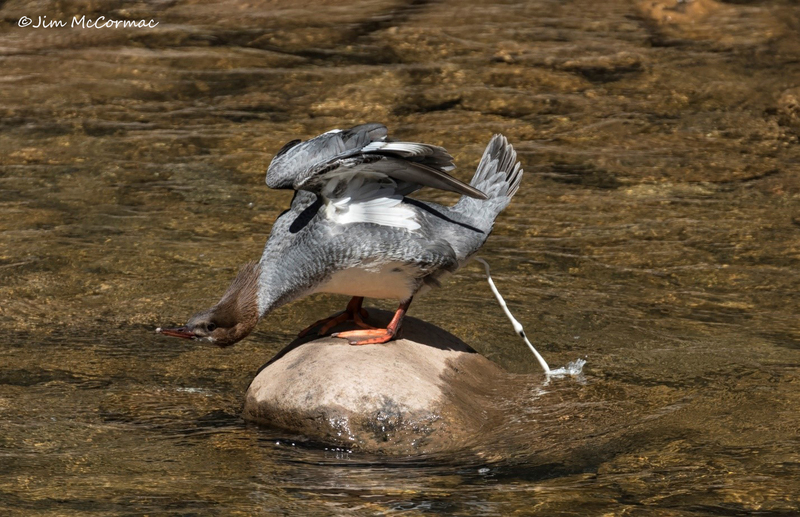 A female common merganser releases an explosive stream of guano. Our group spent quite a while merganser-watching, but it wasn't all ducks. Over the course of the fields trips that I was on, we had great studies of many warbler species including cerulean, Kentucky, blue-winged, bay-breasted, worm-eating, Canada, blackburnian, and many others. 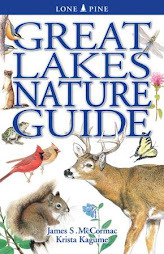 Plus, scores of other species, more plants than you could shake a stick at, salamanders, butterflies, various mammals, and lots of other stuff. Hope you can make the New River Birding & Nature Festival 2019!